I opened the suitcase and was confronted with a pile of sweaty t-shirts and shorts. I quickly scooped all the clothes into the laundry basket. At the bottom of the suitcase I noticed the two small rocks I had collected on one of my walks about the island. I shook my head. Why did I insist on the idea that some day in the distant future I would refresh my high-school geology by analyzing rocks and minerals? I opened the desk drawer and fetched two small ziplock bags. I put a rock into each bag and labelled them “Ibiza 2010”. I opened the wardrobe and pulled out a heavy box. I placed the two rock samples in the box alongside hundreds of similar bags. 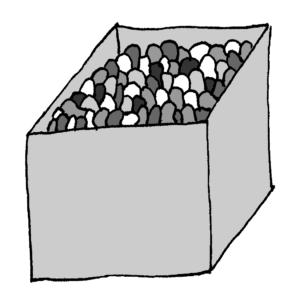 I closed the box and deep inside I knew that I would never see these stones again.